As we reported earlier, a more prominent variant of the Google Home was in works. Turns out, it indeed was, and now we have Google Home Max. It is a stereo speaker with Google Assistant onboard, priced at $399. The Home Max comes with two 4.5-inch woofers with tweeters covered under the fabric speaker. It also features far-field microphones that catch your voice even when the speakers are booming with sound. It means that the Assistant on the speakers can listen to your commands regardless of how noisy your surroundings are. Similar to Apple’s HomePod, Home Max adjusts itself according to the room built, thanks to the smart machine learning technology dubbed Smart Sound. Google touts that Smart Sound tech can tune your Home Max according to the kind of audio that you’re playing on it, for example – a song, phone call, or a podcast. Unlike Apple’s HomePod, which is limited to Apple Music, Google’s Home Max is compatible with a slew of music services (free and paid) Spotify accounts, YouTube Music, and Google Music. Regarding design, Home Max’s front panel is made out of the same fabric as Home Mini. The fabric allows sound and light to pass through it while presenting it with a softer outlook. The rear panel is made up of polycarbonate that offers the much-needed stability. Under the hood, Home Max features an acoustic brace, two 4.5-inch high-excursion woofers, and 0.7-inch tweeters. 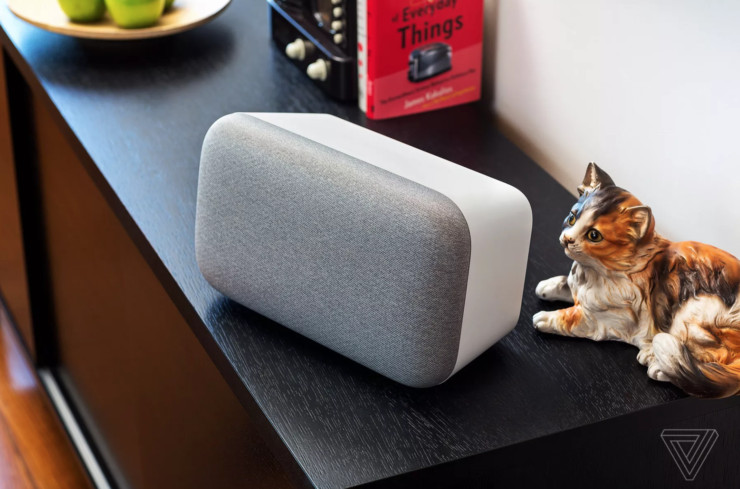 Google claims that the Home Max is almost 20 times more powerful than the Google Home that featured a single two-inch driver and dual two-inch passive radiators. You can put the Home Max horizontally or vertically, thanks to the magnets on it that keep it from falling. There are touch controls on the device along with support for connectivity options like Bluetooth, Google Cast, and a 3.5mm audio jack. Google is offering a 12-month free subscription of ad-free YouTube Music with every Home Max. The device will be up for sale in December with a price tag of $399.